Two stolen puppies have been reunited with their owners by Essex Police. The Terrier pups were taken during a burglary in Uttlesford. Police tracked the dogs down to a house in Great Dunmow. A 52 year old woman has been arrested on suspicion of burglary. 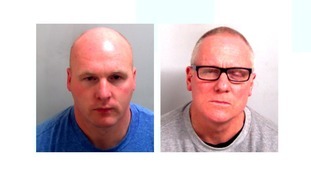 Andrew McVicar, from Basildon, and Colin Garrod, from Southend, carried out the fatal attack at a bungalow in Hullbridge last March. A gang of five used a JCB to smash their way into a building society and steal a cash machine. The attack took place inn the early hours of this morning at the Halifax branch at King Street in Saffron Walden. Police say five suspects used the digger to pull the machine free before it was loaded into a white van. It's also believed two other vehicles, a silver and white car, were with the van as it left the scene. The police helicopter was sent up but couldn't trace the suspect vehicles. Police would like to hear from anyone who has information, CCTV or dash cam footage. Essex Police say they've had their busiest 24 hours so far this year. From 6am yesterday (July 7) to 6am today, 1,860 incidents have been reported to the force. They say it's led to "really heavy demand" on officers and staff and that it compares to just over 1,500 incidents during the same period last year. “This increase in demand could be down to a number of factors but has meant officers and staff across the county have been working even harder to keep our communities in Essex safe and I want to thank them for that. “I would ask the public to help us out too and really think about whether they need to call us before picking up the phone. Is it a police incident or would another agency be more appropriate? Could you report this crime online? Police are investigating after thousands of bees were stolen in Essex. Sixteen colonies were taken inside their hives, which weigh about 50kg each. It happened sometime overnight on Thursday (May 17), between Beazley End and Bocking Churchstreet in Braintree. Essex Police want anyone with information to contact them. "If you saw any suspicious activity in the area during this time, please call 101 and quote reference number 42/69326/18. "Alternatively, you can contact the Crimestoppers charity 100% anonymously on 0800 555 111 or use the anonymous online form." John Pordage's mum Sue Wilson says her son hasn't had justice and that gun crime in Essex must be tackled. Officers working on a drugs investigation had an unexpected surprise when they found a 4ft crocodile and 16 live snakes during a house search in Essex. A man was arrested earlier this week in connection with an ongoing investigation into a cannabis factory found in an industrial unit in Cranes Farm Road, Basildon, in November 2015. Following this week's arrest, officers searched a house in Burdett Avenue, Westcliff where they found a caiman crocodile and 16 live snakes. Among them were cobras, copperheads, pythons, a Madagascan giant hognose snake and a scorpion. A 36-year-old man from Basildon was arrested on suspicion of cannabis production, keeping a dangerous animal without a licence, and animal cruelty offences. He was released on bail until February 13, pending further enquiries.